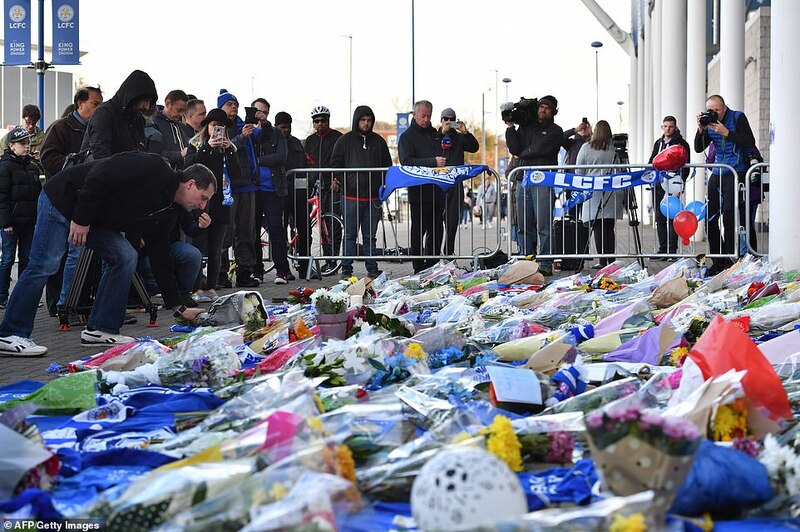 Tearful Leicester City fans have gathered to lay flowers at the King Power Stadium today after reports the club’s owner was on board a helicopter which crashed and burst into flames last night. 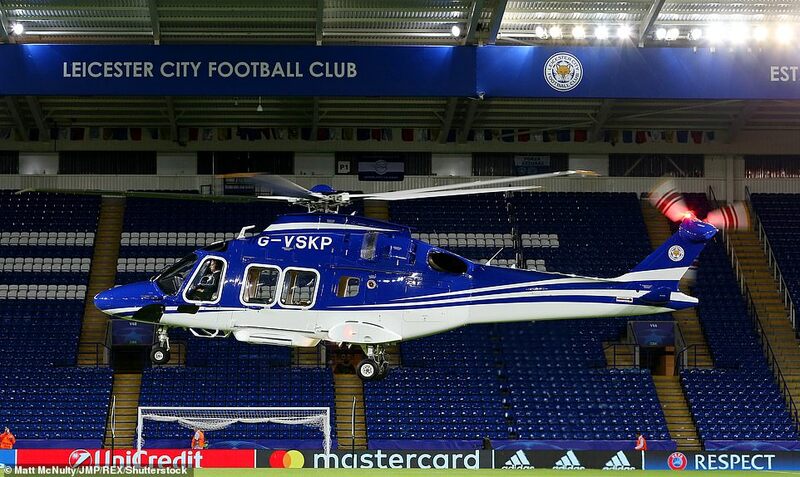 The helicopter – feared to have been carrying popular owner Vichai Srivaddhanaprabha – and two pilots crashed in the corner of a car park moments after taking off from the centre circle after a Premier League game last night. 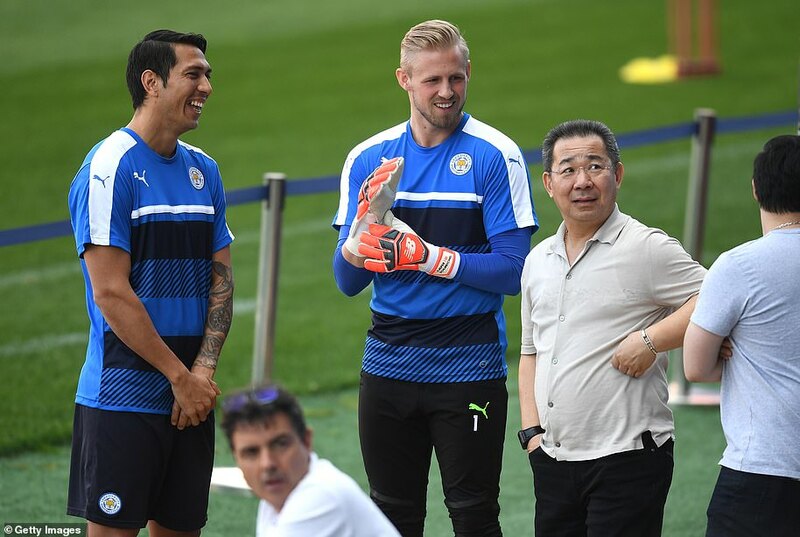 Early reports said Mr Srivaddhanaprabha’s daughter was on board with him at the time, although sources at Leicester FC have since denied this. The BBC has reported that a family source said the owner himself was on board. 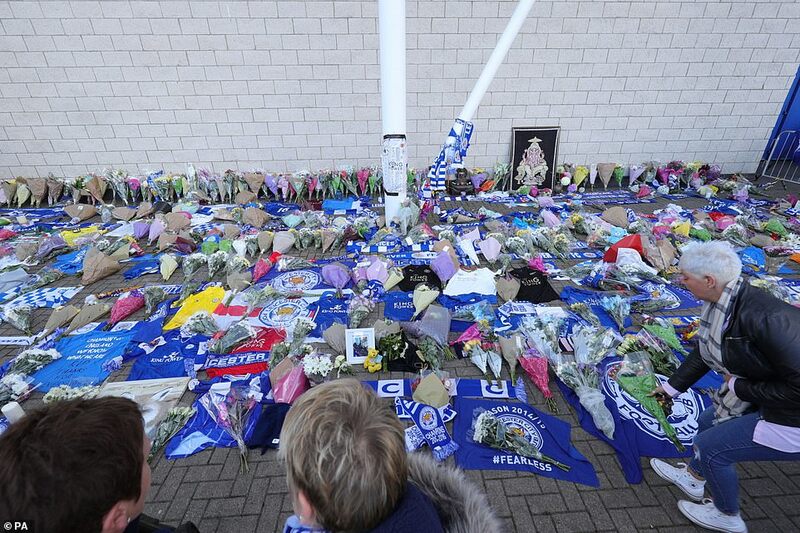 Fans who gathered at the ground this morning called it Leicester’s ‘darkest day’, paying tribute to the owner who helped them to a miracle Premier League triumph in 2016. 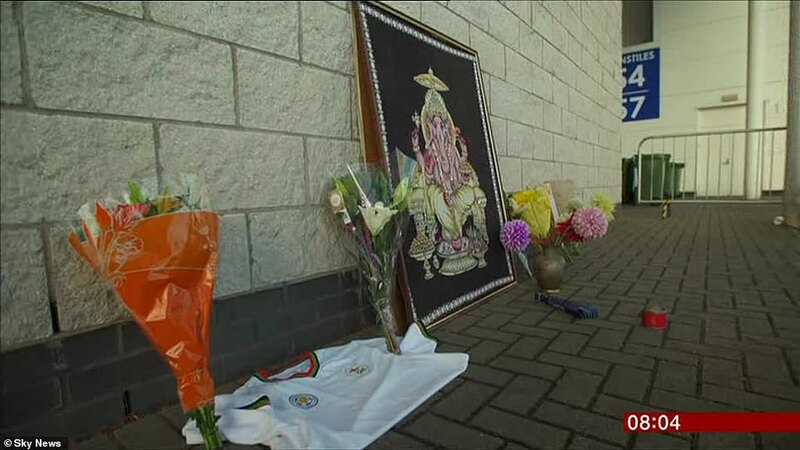 Police have yet to comment on the condition of Mr Srivaddhanaprahba, 60, who has four children. With fans waiting desperately for news police said this afternoon they were ‘working with a number of other agencies’ to release a statement. 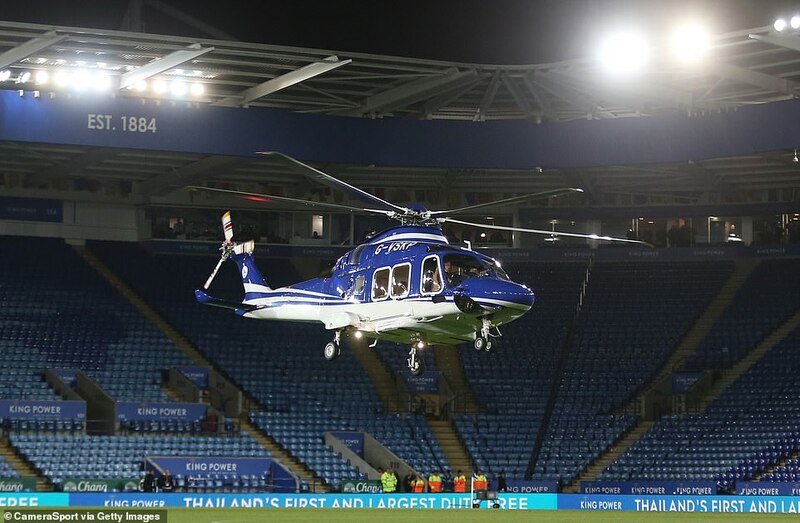 Mr Srivaddhanaprabha’s helicopter was heading for Luton Airport where he was due to catch a flight to Thailand, Leicester sources said today. 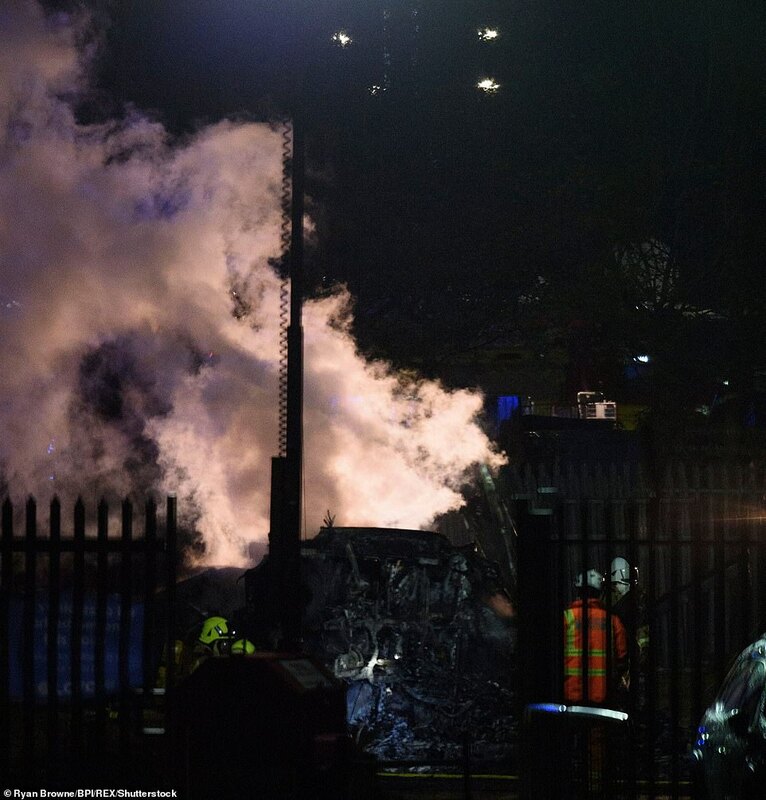 Witnesses have said the ‘engine stopped’ in the air before the helicopter plummeted to the ground at around 8.45pm. 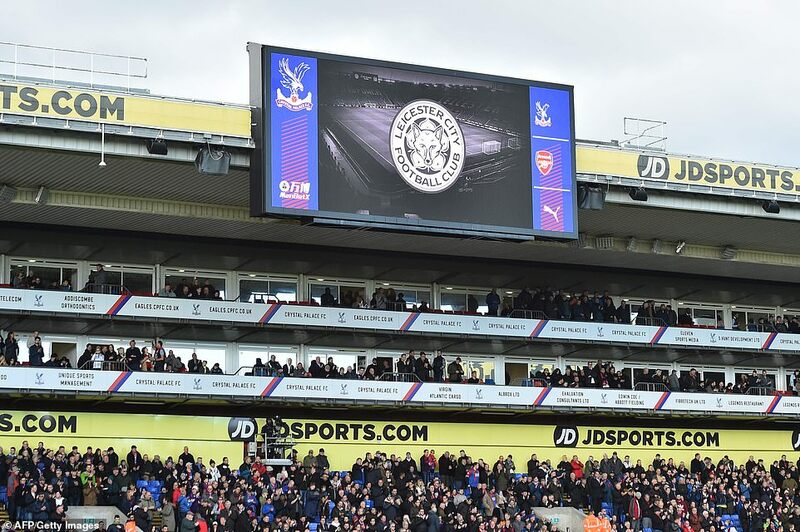 As Premier League fixtures resumed today there was a minute’s applause held at Crystal Palace in solidarity with Leicester, and a minute’s silence at Burnley, even as fans did not yet know the outcome of the crash. 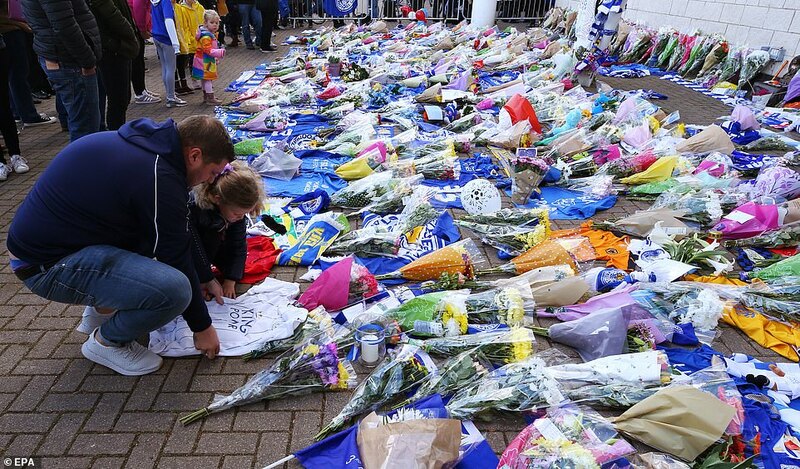 Outside the stadium today a sea of flowers and blue football scarves has grown as fans wait anxiously for news on the helicopter disaster. 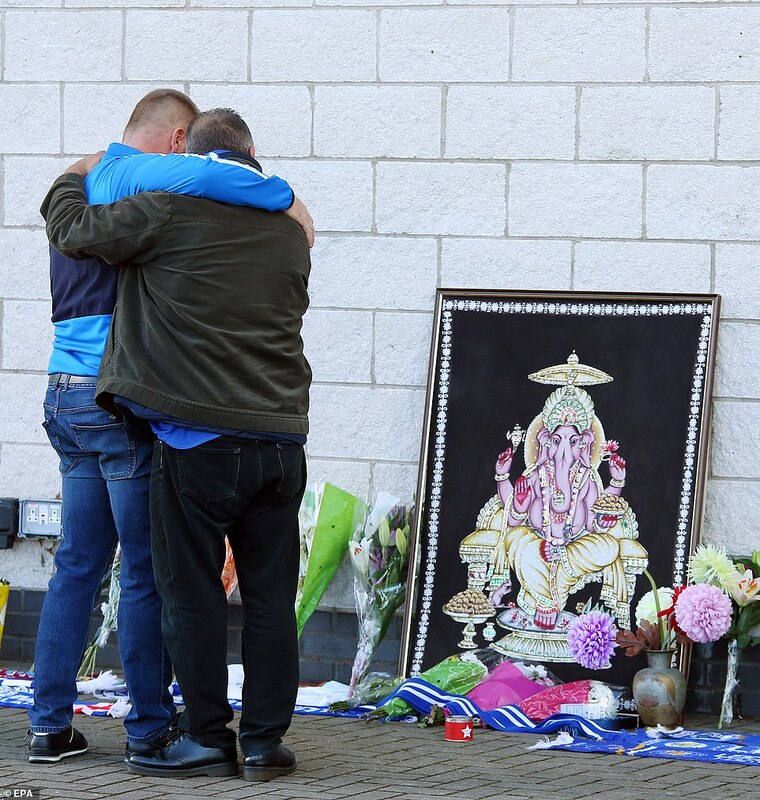 Karen Kennell, 60, a primary school teacher from Leicester, said: ‘I was at the game yesterday and I was at home when I heard the news just after half past eight. ‘He’s contributed so much to the club and the city, when he first came they were in dire straits and he brought them back up to what they are today. 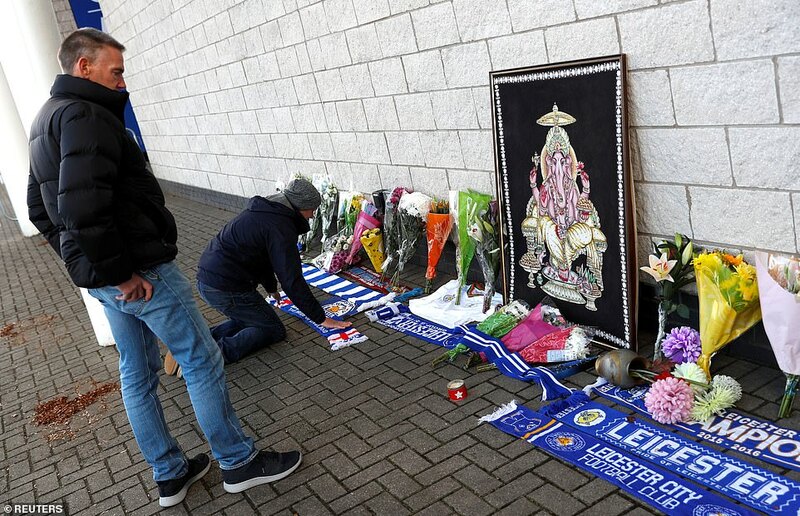 Lifelong fan Tom Fall,53, a civil servant from Leicester said: ‘I was at yesterday game and I heard about it when I got home, it takes me about half an hour to get home and I was just getting something to eat. ‘I sat down and looked at the fans forum and someone had posted that the helicopter had crashed, I could not believe it. 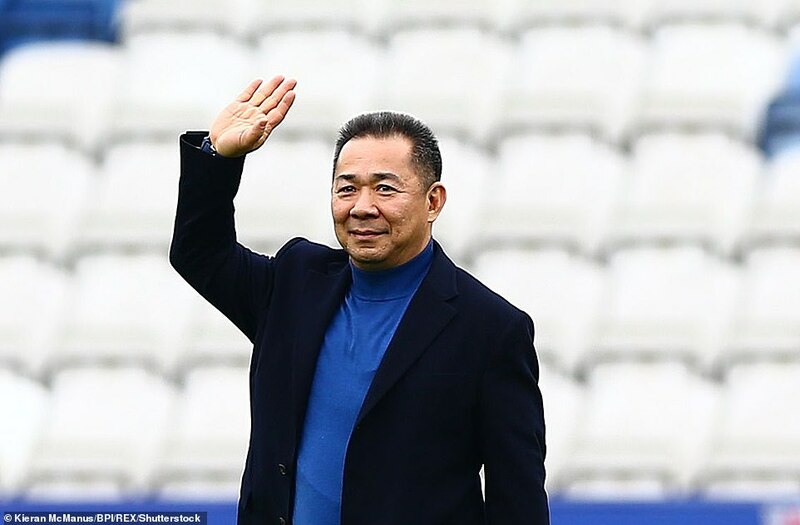 ‘OK so he was a businessman and many people like him take over clubs and wold be quite aloof but its not been the case with him – he developed a real connection with the fans and the community and it’s ultimately led to us winning the league. 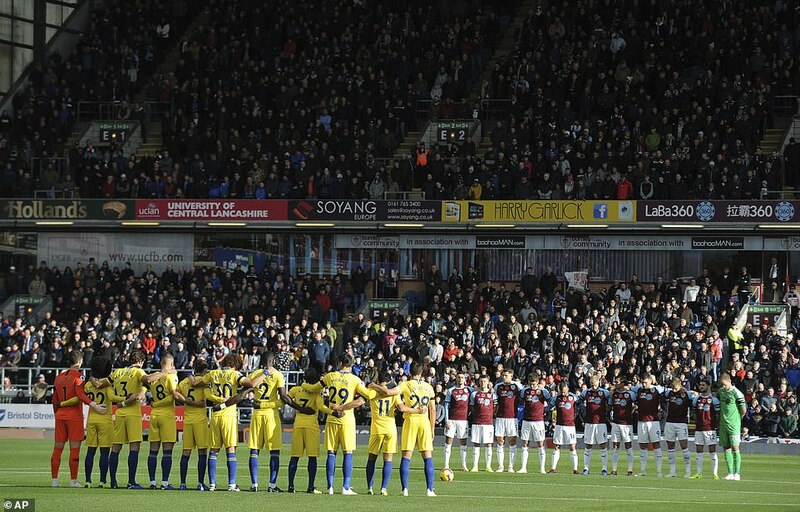 ‘He’s left a permanent mark on the whole city not just the club. If he hadn’t come we would not have had so much success. 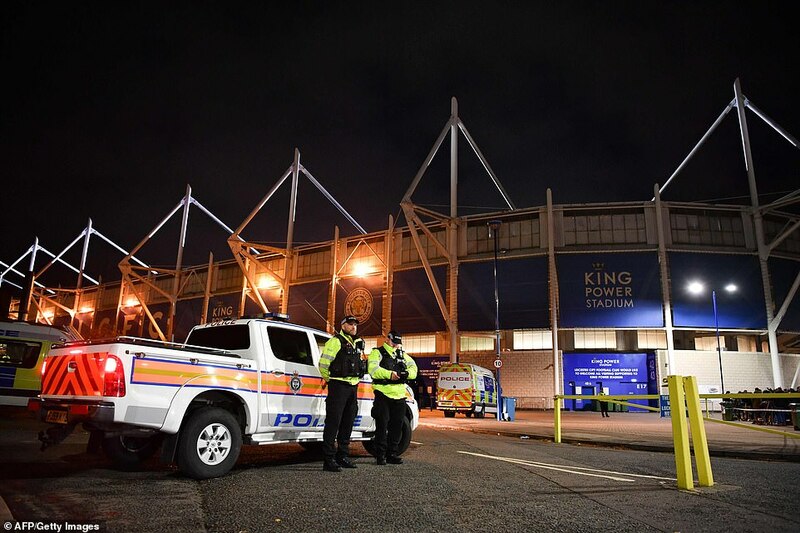 In their latest statement on Sunday afternoon police said: ‘We understand that many people are waiting for an update about the helicopter crash at King Power Stadium last night. 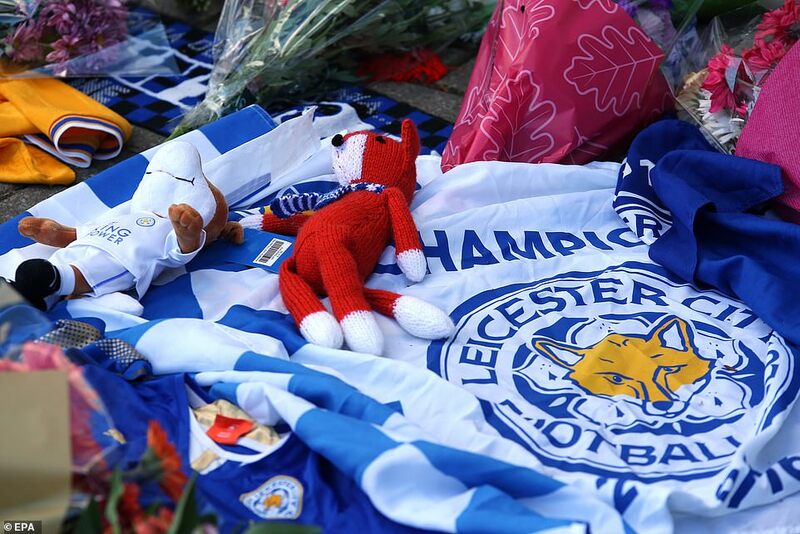 A police officer then rushed towards the wreckage belonging to the Leicester City owner. 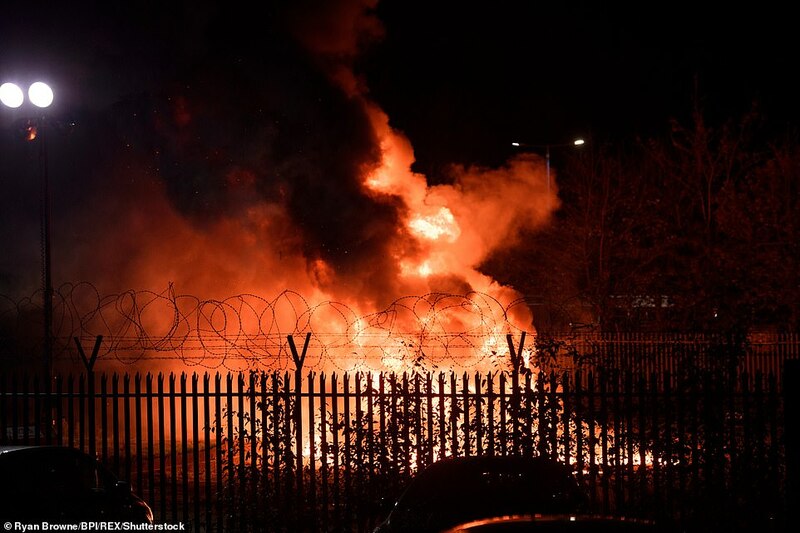 The unnamed officer attempted to pull open the door, to save those inside, before an ‘explosion’ turned the wreckage into a fireball and forced the Leicestershire officer back. 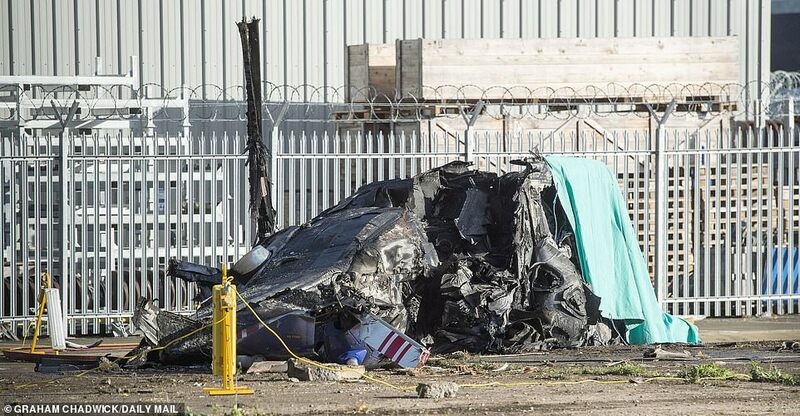 It is not clear if there are any survivors after the aircraft belonging to billionaire chairman Mr Srivaddhanaprabha crashed just outside the car park. Witnesses reported seeing the Augusta Westland AW-169 aircraft suffering engine trouble and spinning out of control shortly after it took off from the centre-circle. The chairmam’s son, Aiyawatt ‘Top’ Srivaddanaprabha, also the club’s vice chairman is now making his way to the UK from Thailand. Despite claims one of the chairman’s two daughters was on the helicopter when it came down, it was later suggested his children were not with him. 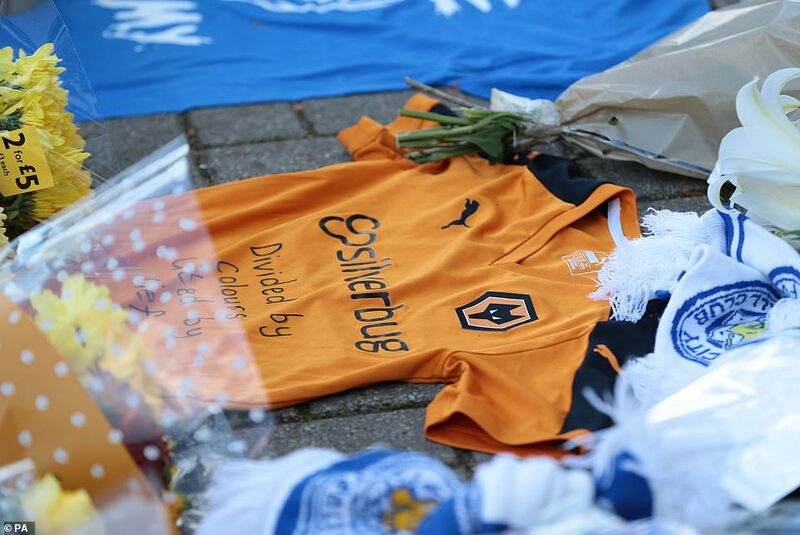 His eldest child, Voramas, 36, works for King Power and had studied at a London university. 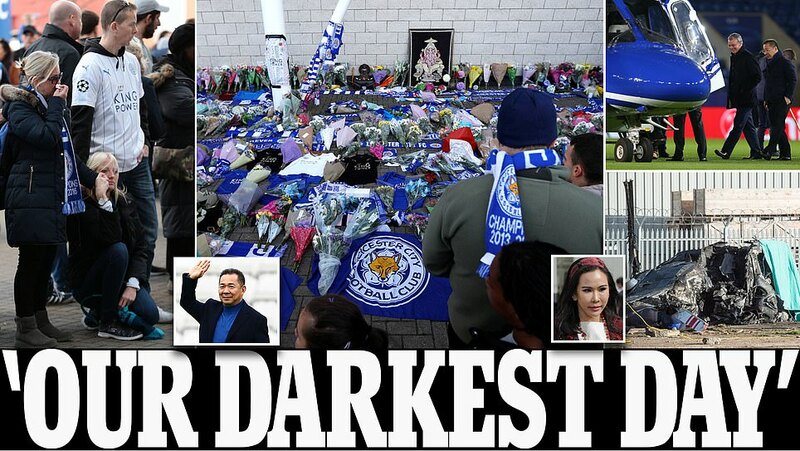 Another of the chairman’s children, Leicester’s vice-chairman Aiyawatt ‘Top’ Srivaddanaprabha, was not involved in the accident, it was claimed. 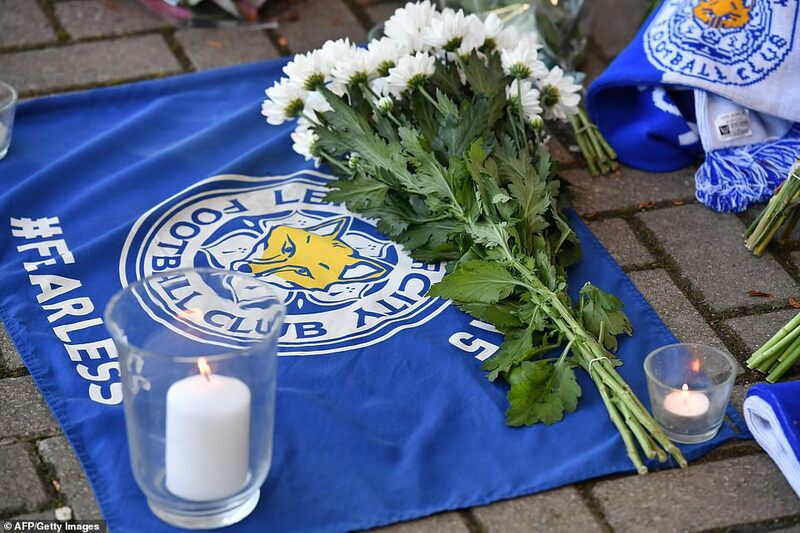 Leicester Director of Football John Rudkin was also safe, according to Sky sources. 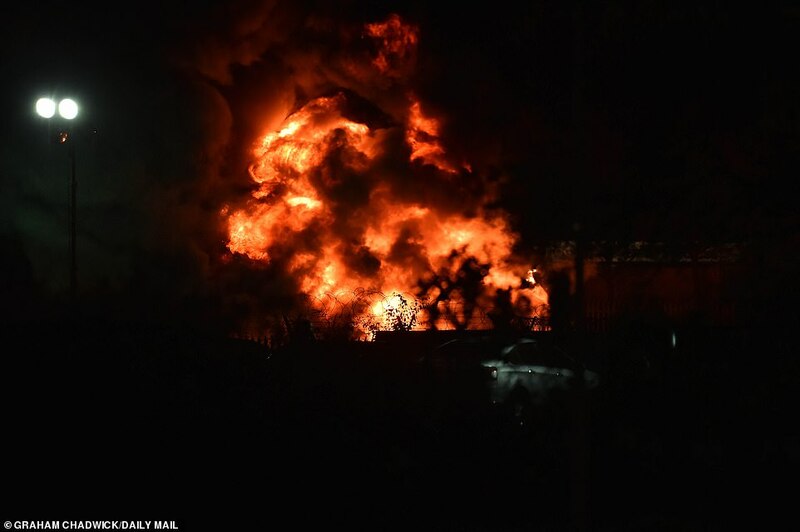 According to eye witnesses a police officer was the first to run to the crash site and attempt to pull open a door but was ‘forced back by an explosion’ while his colleague searched for an extinguisher. 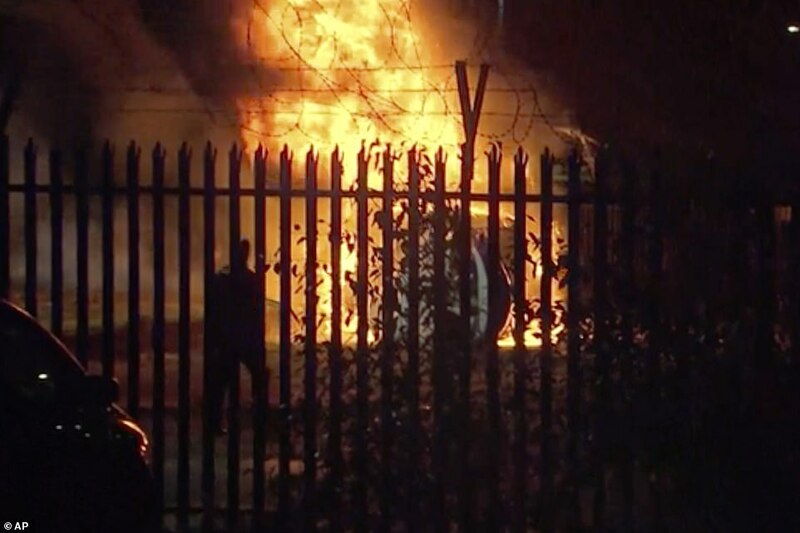 Local fan Leo Brooker told BBC Radio 5 Live: ‘One of them was looking for something, I don’t know what he was looking for inside the car something to prevent the fire, I don’t know. ‘And the other man, the other one, he run straight away to the helicopter and he was trying to break the window of the helicopter with, I don’t know what he had in his hand, a big metal or… I couldn’t see ’cause it was too dark. ‘But one of the policeman was trying to break the window and trying to get in and the other one was inside the car looking for something and then the next minute I see the police officer he had a fire extinguisher trying to prevent the fire and i don’t know even I was still scared. It is understood emergency services spent twenty minutes attempting to extinguish the flames. 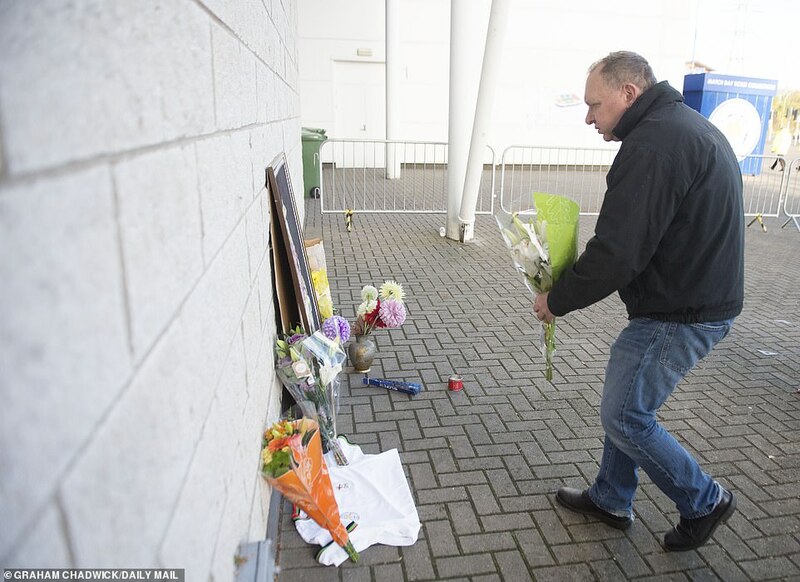 Early on Sunday fans began to arrive to the stadium with flowers, although it is not yet clear who was travelling in the helicopter at the time of the crash. Initial reports had suggested Claude Puel may have been onboard, however, Gregory Campi, the AS Monaco Team 3 coach told Nice-Matin, this was not correct and the club’s manager was safe. Mr Srivaddhanaprabha made his money in retail in Thailand and his King Power duty-free shops are in every airport in the Asian country. 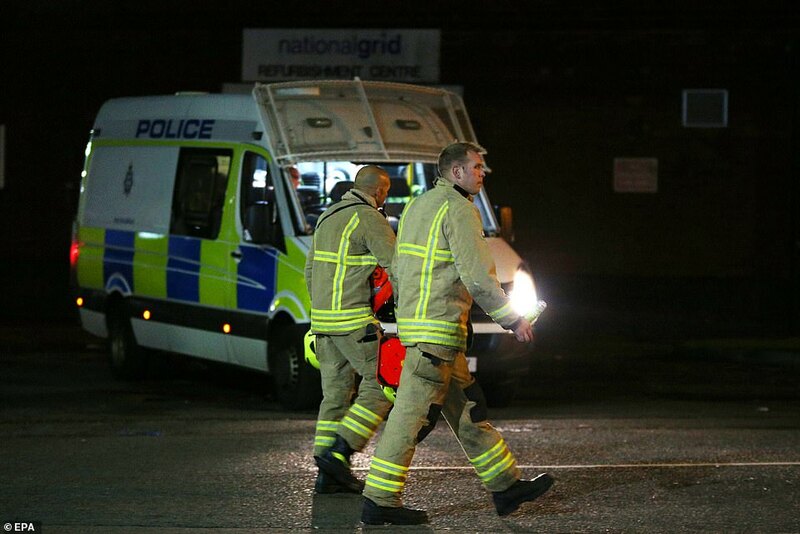 Police and ambulance services were unable to provide any details as to whether there had been any causalities. 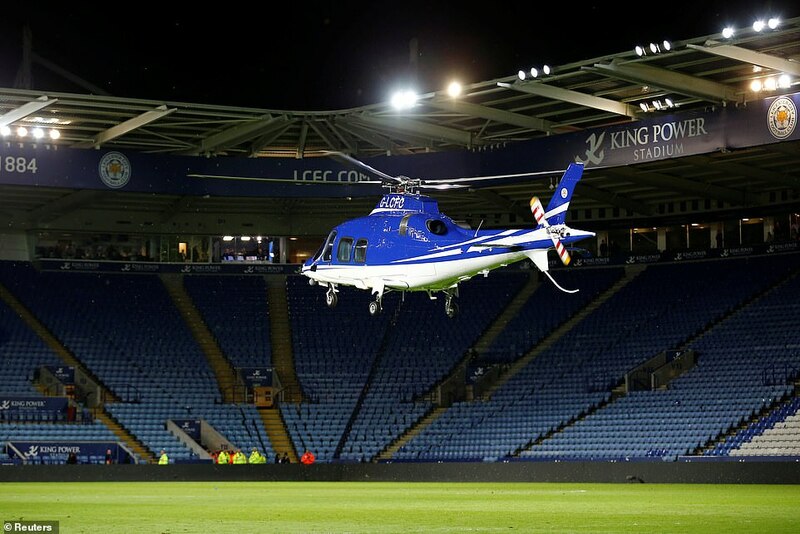 Fans were shell-shocked and some broke down in tears as the helicopter plummeted to the ground near the club’s staff car park at around 8.30pm on Saturday, shortly after Leicester’s 1-1 draw with West Ham. 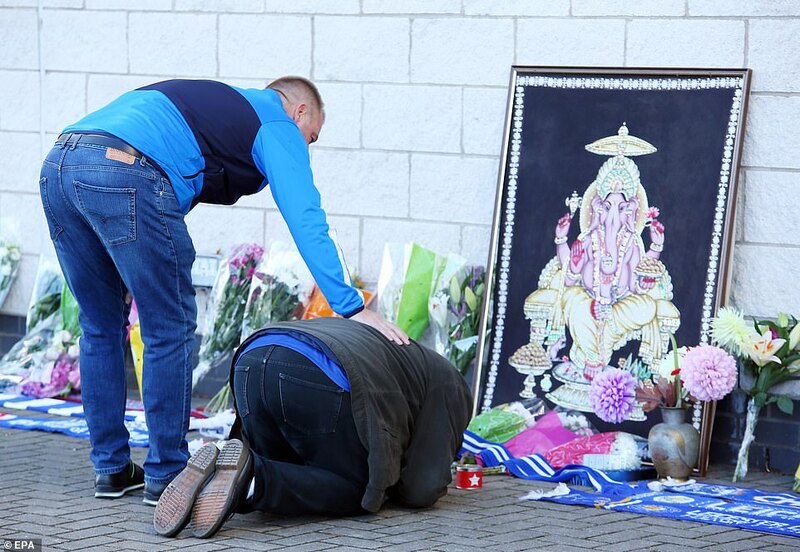 David Radburn who runs The Local Hero paid tribute to the club boss feared to be dead. 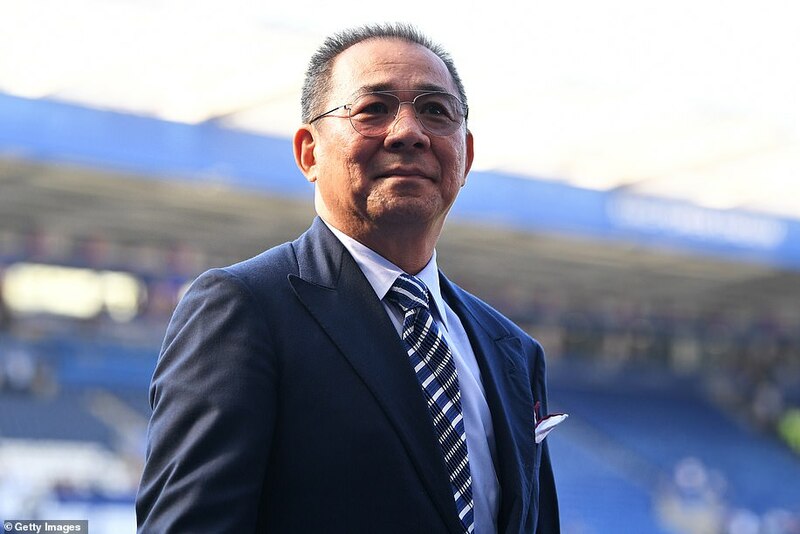 He said: ‘He gave Leicester our dreams. We never ever thought we’d win the Premiership and we did it with his and his family’s guidance. Mr Radburn, general manager, said: ‘Then when news broke about the crash there was just silence. No one could believe it and everyone’s still in shock. 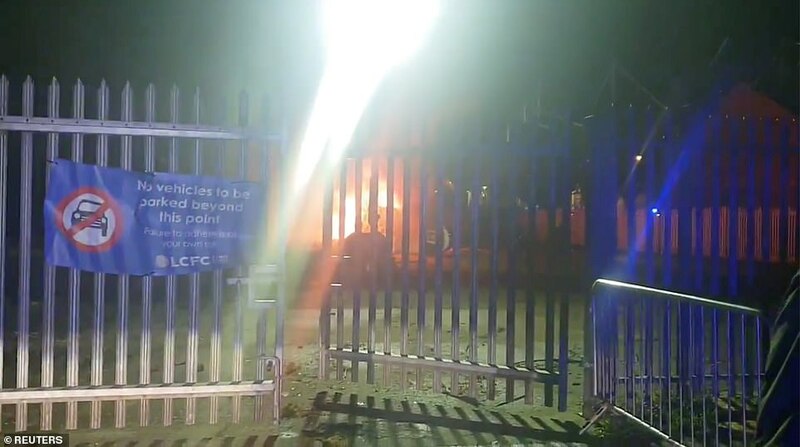 The £2million aircraft which has eight seats was spotted hovering over the south east corner of the ground before spluttering and spiraling to ground, near Filbert Way, and bursting into flames. Spectators at the game said they witnessed the helicopter spinning out of control and that there was a problem with the tail rotor of the aircraft. 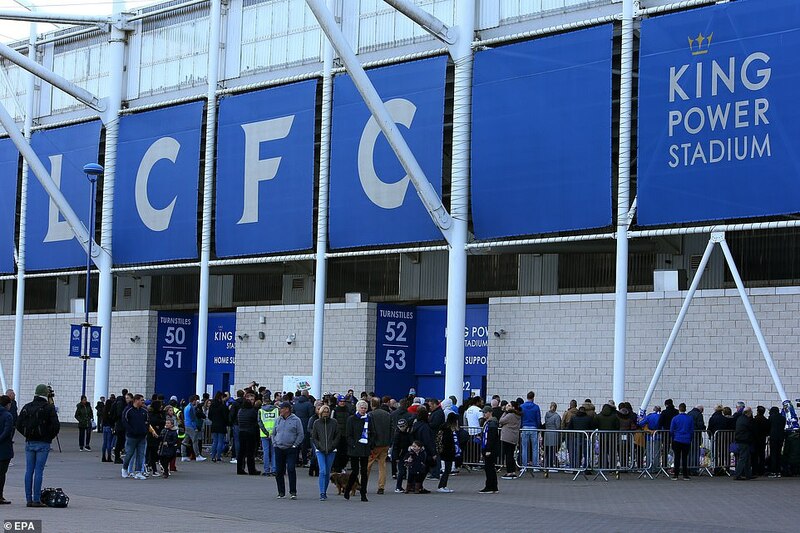 One man, who wished not to be named, but has had a season ticket for over 40 years, told Sky News: ‘I saw Kasper Schmeichel run out first and then loads of security guards and stewards. Former England legend Peter Shilton and his wife witnessed the carnage unfold. His partner Stephanie, 50, said: ‘We are both in shock on our way home. It happened straight in front of us as we were leaving the ground. 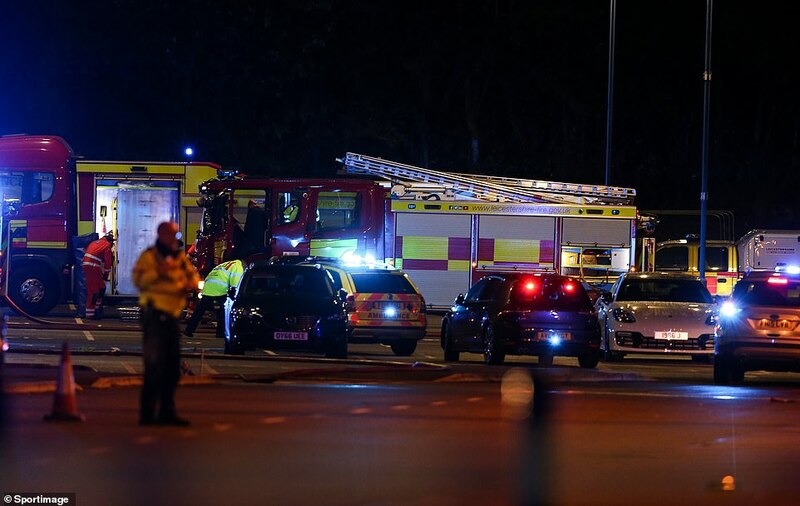 A reporter for Sky Sports News said people were ‘running for their lives’ in the aftermath of the crash. 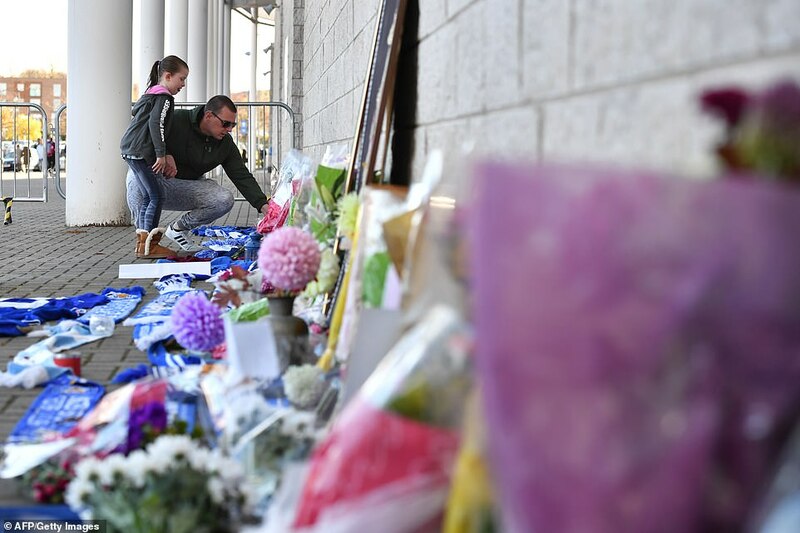 Rob Dorsett said: ‘The car park was certainly it was still populated with people at the time whether that was members of staff leaving the stadium or spectators watching the game. It’s so close to the stadium, a couple of hundred metres – if that – from the stands. ‘There has be to concern for people who are walking back to their cars or get buses back to the train station and any impact that would have. ‘An eye-witness and his nephew ran for their lives, they were that concerned they were going to be hit by the wreckage of the helicopter. It burst into flames as it hit the ground. There has to be concerns for people in and around the area after the game. 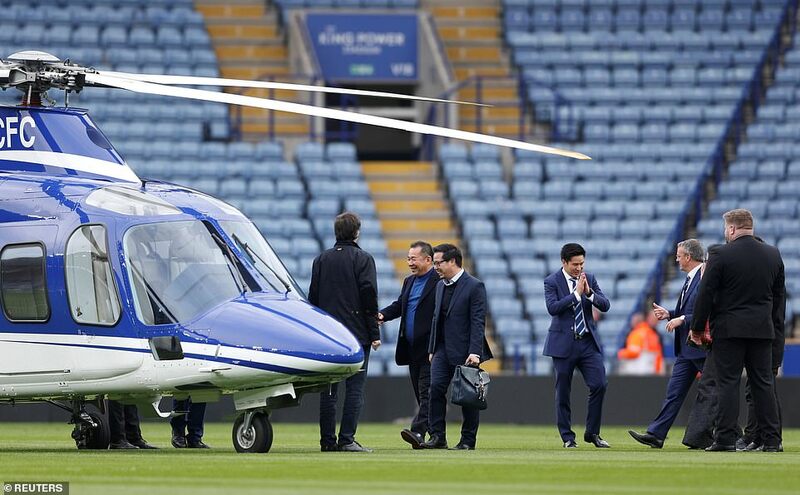 Mr Srivaddhanaprabha’s and his entourage leaving the King Power by helicopter has become a familiar sight as he frequently takes off from the centre circle of Leicester’s ground. 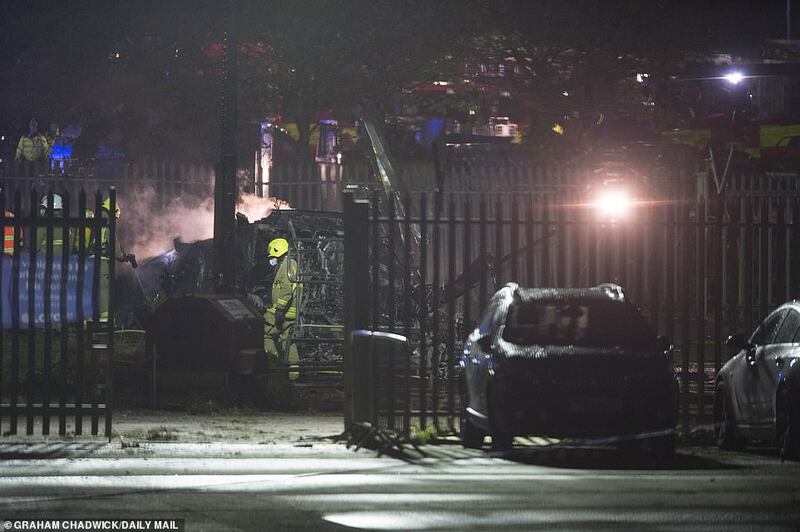 Photographs near the crash site show at least one vehicle with its windows blown out and its roof burnt. 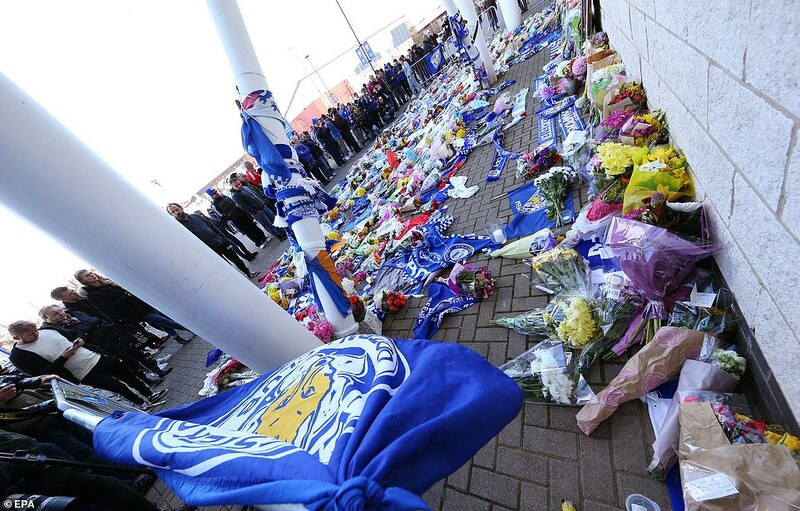 Fans in the city said Leicester will be ‘hit hard’ by the crash. 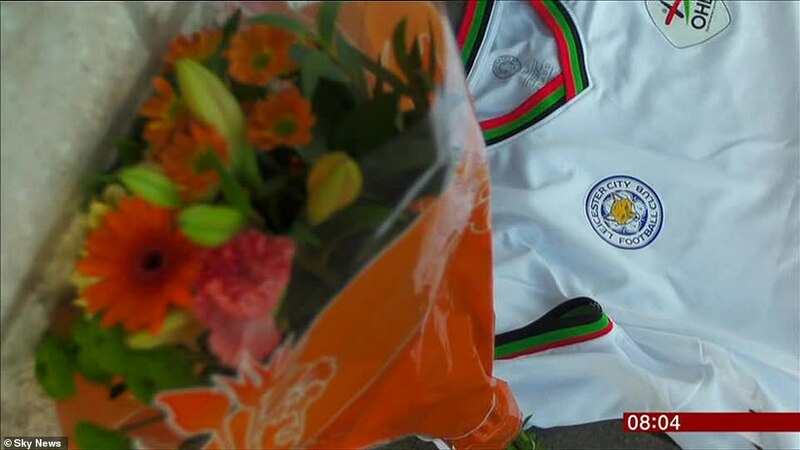 Richard Mobbshas, 67, has been a Leicester fan for 50 years. 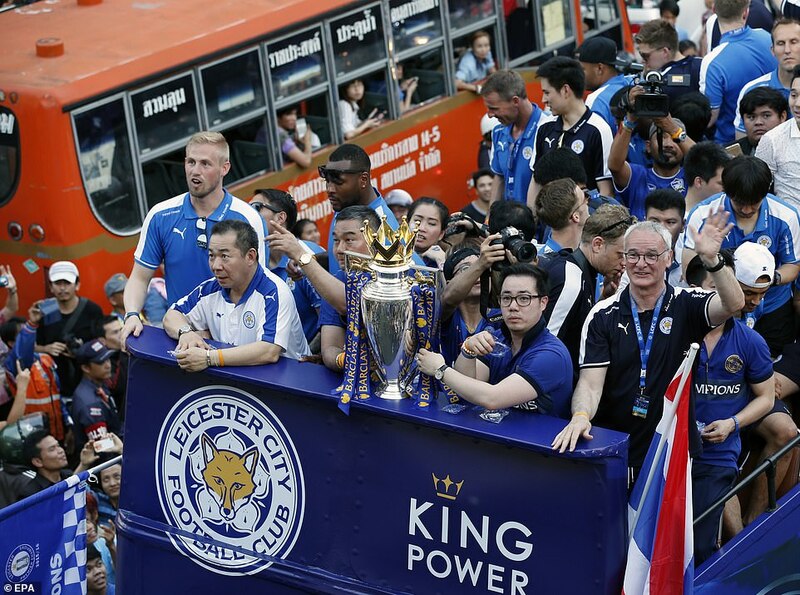 Daniel Cooke, 21, added: ‘I came to Leicester the year City won the title and remember what a wonderful time it was. 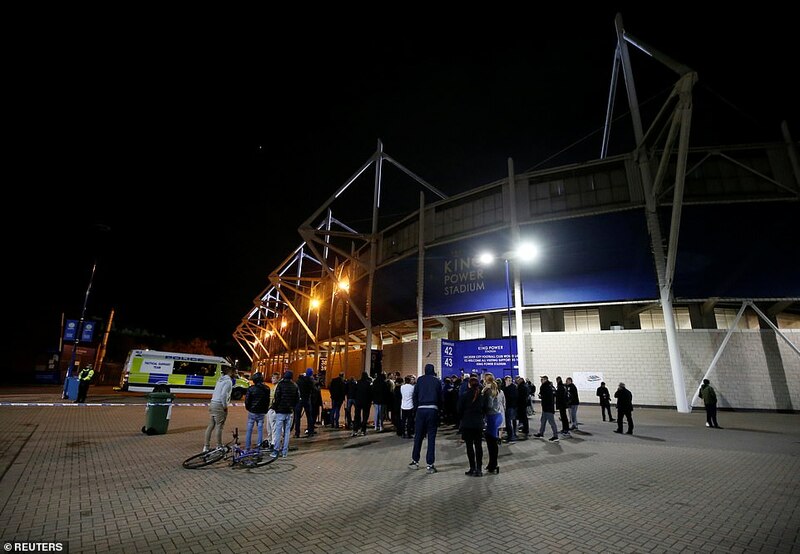 An ambulance and ambulance car was filmed driving slowly away from the King Power stadium shortly before 10.30pm. Tim Acott, Leicester season ticket holder of 40 years, said: ‘It just came out of the stadium already spinning then down to the ground. 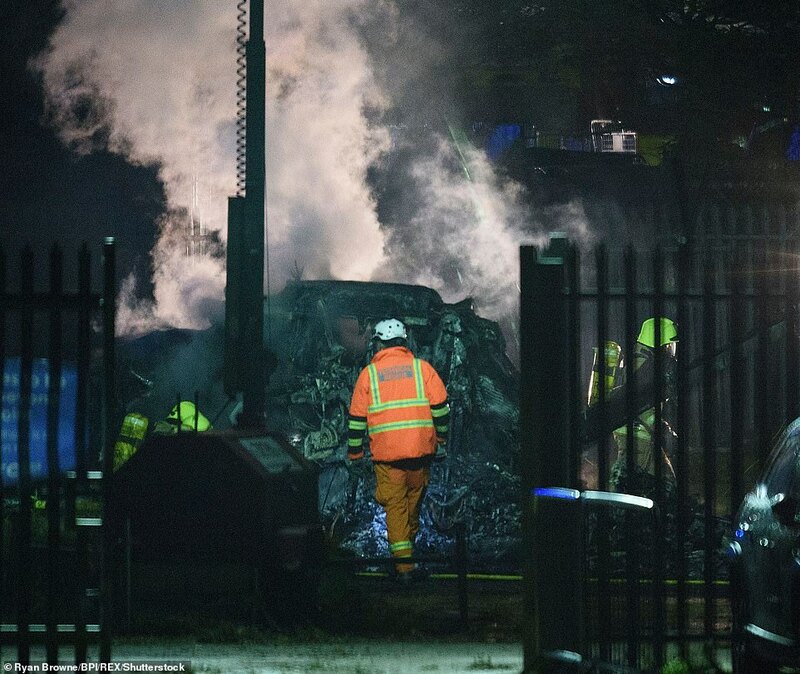 Freelance photographer Ryan Brown, who was covering the game, told BBC Radio 5 Live he saw the helicopter rise out of the stadium before it crashed. ‘Literally the engine stopped and I turned around, and it made a bit of a whirring noise. It turned silent, blades started spinning and then there was a big bang,’ he said. 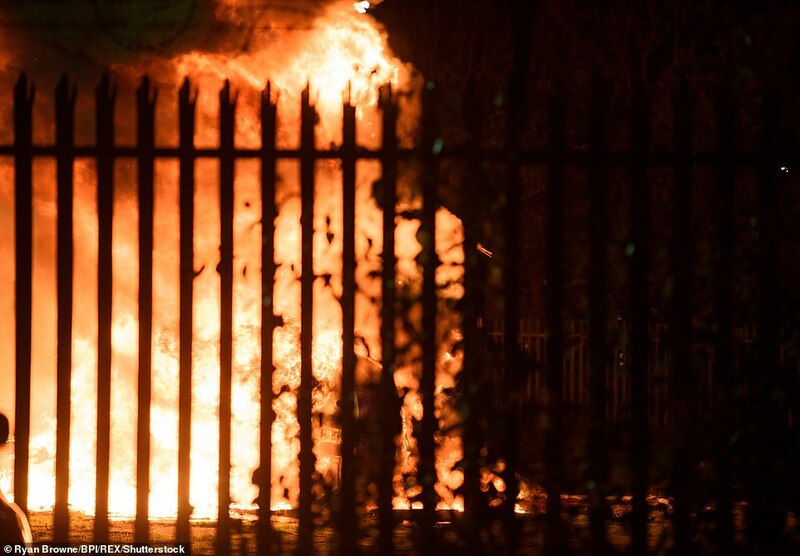 He said he saw ‘a huge fireball’ when he ran to the scene. 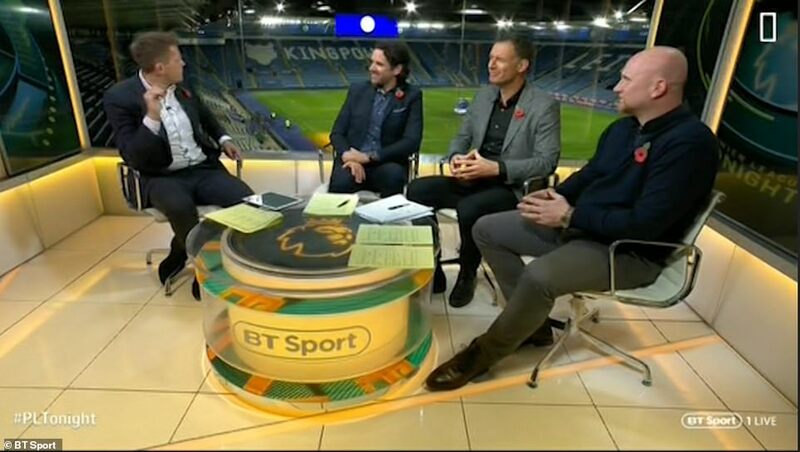 A Leicester City fan named John, who was at the game today, told Sky Sports News: ‘We was in the bar facing the King Power – my nephew was in a real state of shock. He said he saw this helicopter out of control then drop within a second and burst into flames. 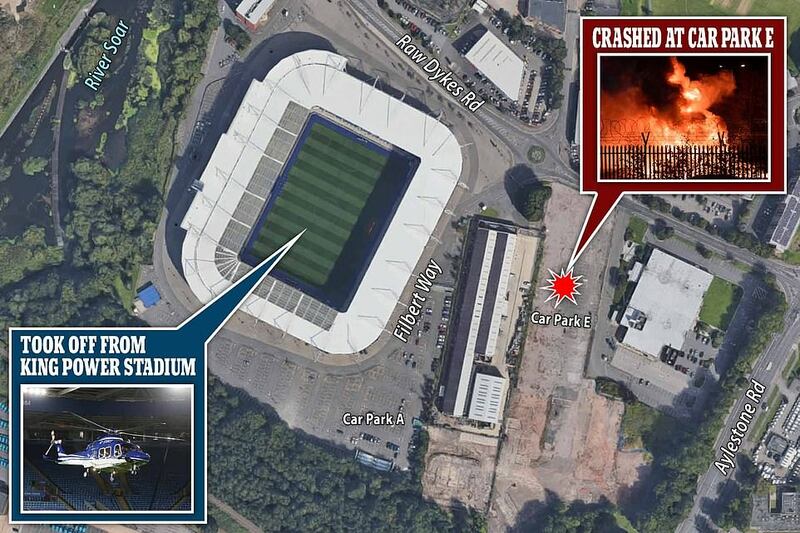 The area around the ground has been closed off, while the stadium was evacuated. 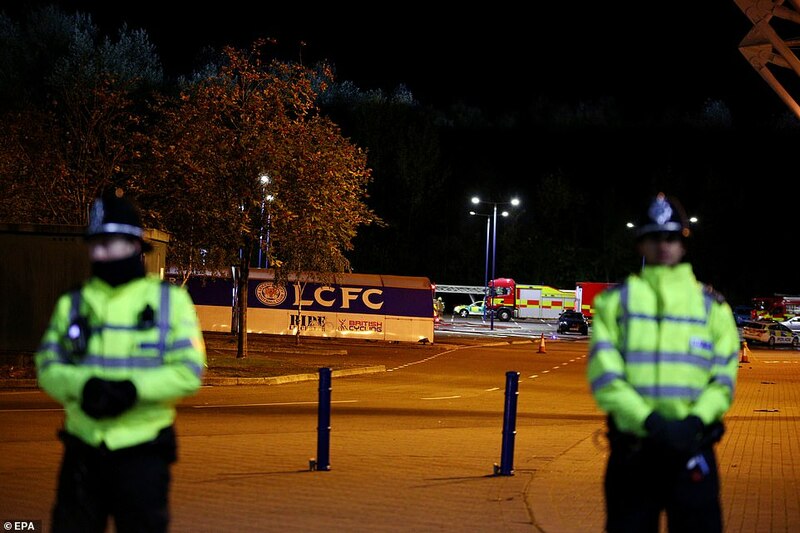 West Ham’s team bus had already left, though some Leicester players were still inside the stadium. 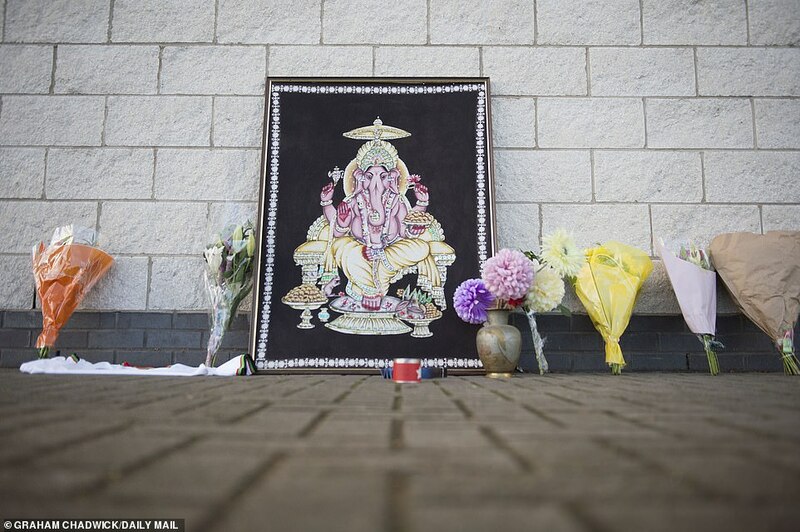 Leicester City defender Harry Maguire tweeted a video of the aftermath of the crash with praying hands emojis. Midfielder James Maddison, Ben Chilwell, Wilfred Ndidi and Jamie Vardy also posted the same emojis following the game. 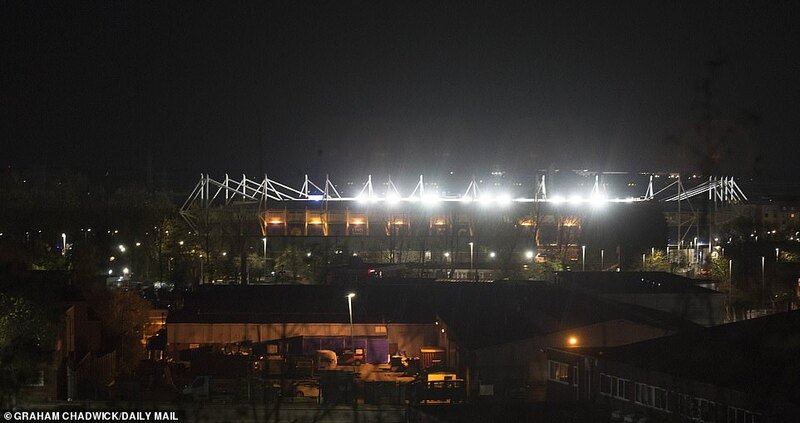 East Midlands Ambulance Service NHS Trust said: ‘We received a call at 8.38pm this evening to reports of a helicopter crash near King Power Stadium. We sent a doctor, two paramedics in ambulance cars, a crewed ambulance and our Hazardous Area Response Team, with the first resource arriving within two minutes of the call. 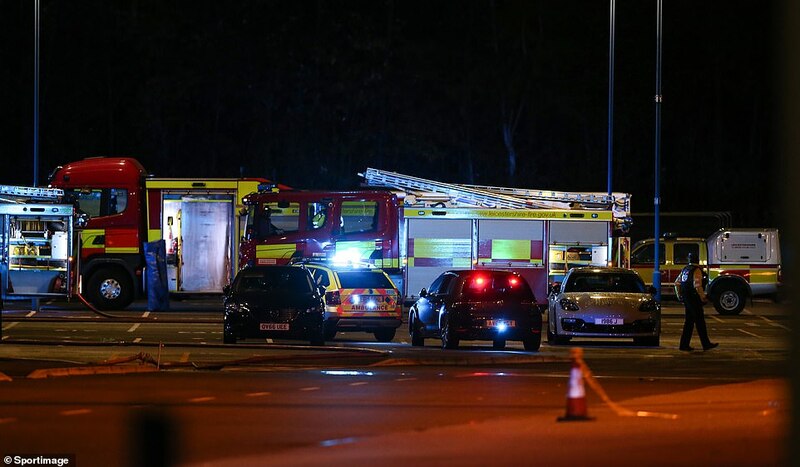 ‘We are currently working with our colleagues in Leicestershire Police and Leicestershire Fire and Rescue Service at the scene. 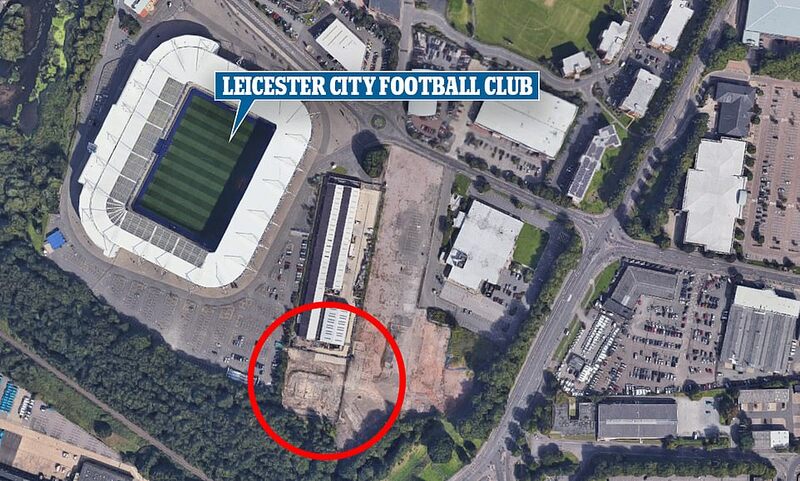 King Power are due to release a statement tomorrow once more details have been confirmed. 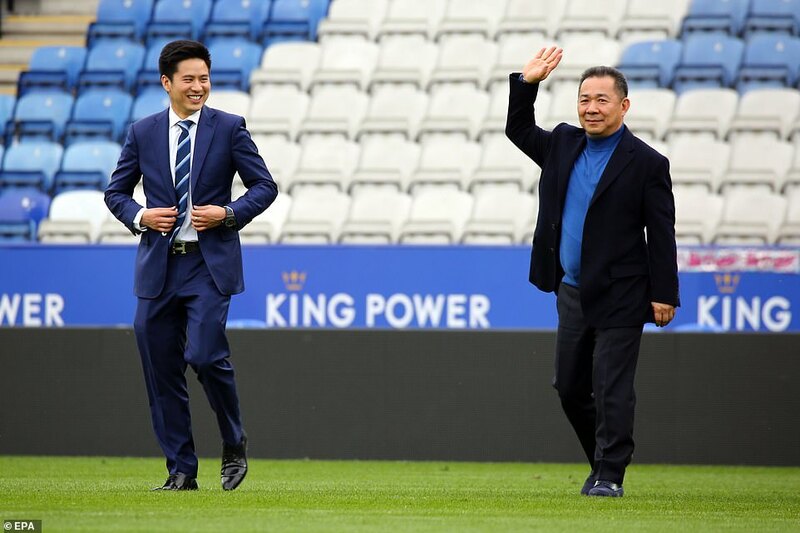 Srivaddhanaprabha bought Leicester City in August 2010 and was named chairman in February 2011. 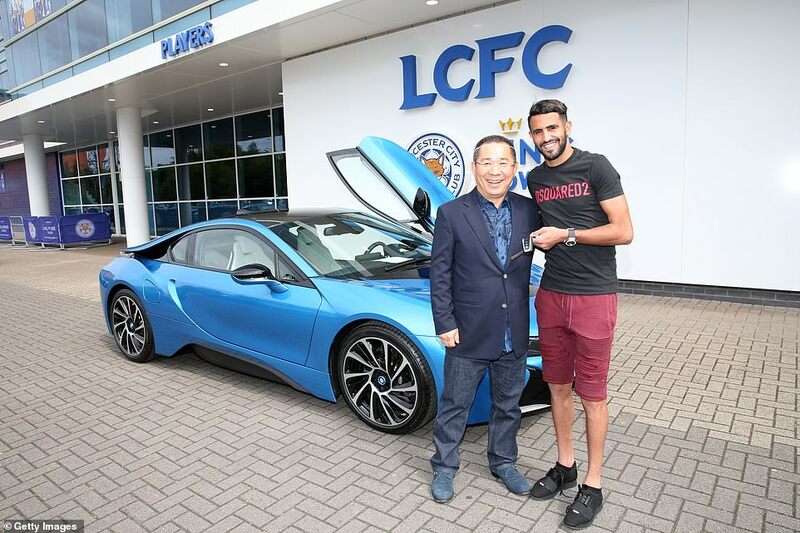 The club famously defied odds of 5,000-1 to clinch the Premier League title in the 2015-16 season – as Srivaddhanaprabha gifted each player their own £100,000 BMW i8 as a reward for their unprecedented success. 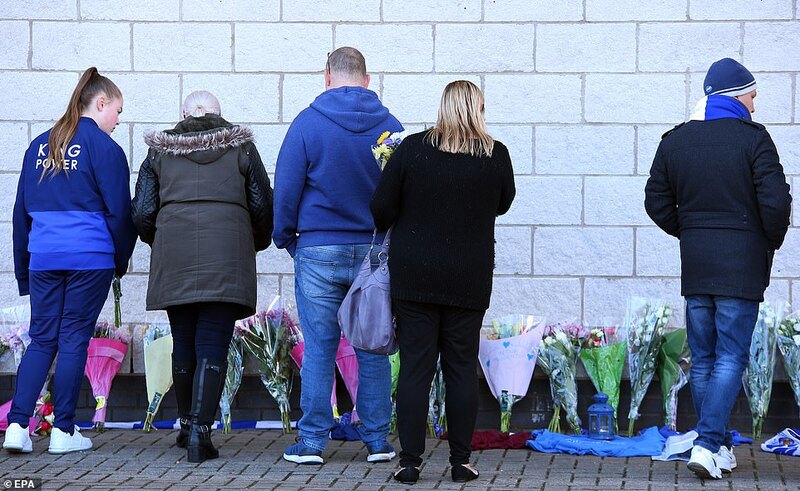 Devastated fans have described how much the chairman means to them. Since he took over in 2010 the club has become firmly established in the Premier League. 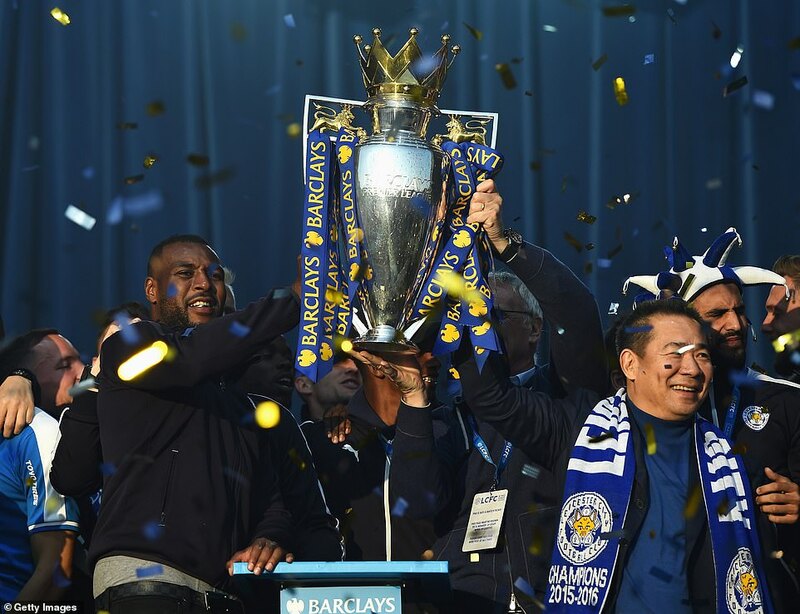 Leicester were promoted to the top flight by winning the Championship in the 2013/14 season and just two years later shocked the world by winning the Premier League. 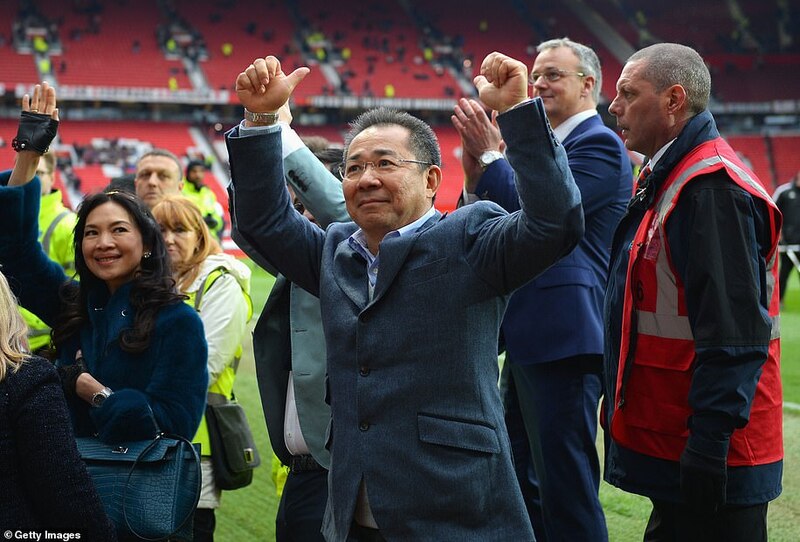 Season-ticket prices have been frozen for the past four seasons, while Srivaddhanaprabha also donated £2 million ($2.5 million) to help build a local children’s hospital in the aftermath of the club’s title triumph. 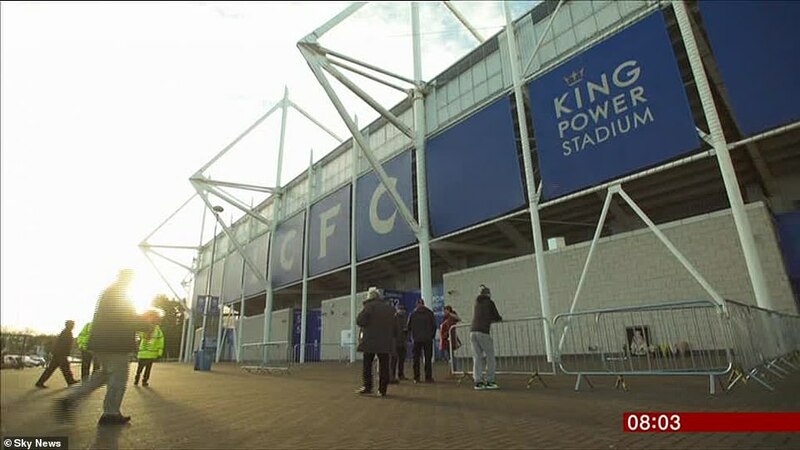 King Power, is now a staple of the country’s airports and the brand also have the naming rights to Leicester City’s stadium. 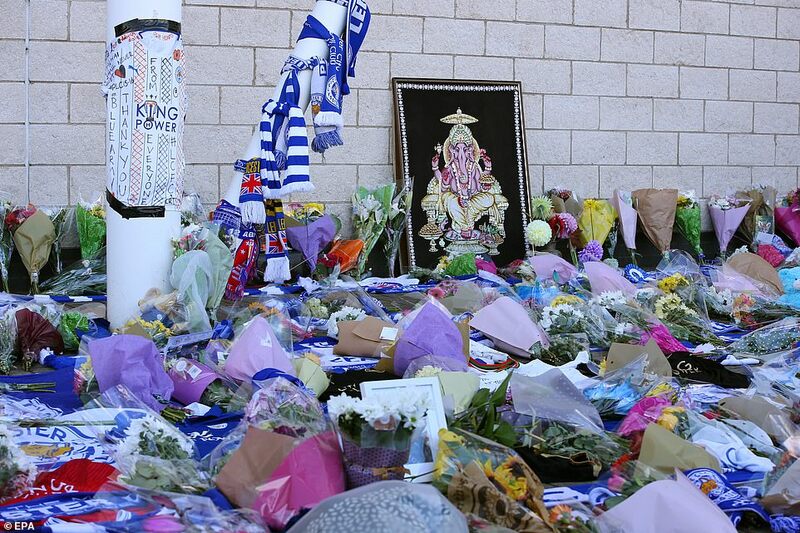 Sunday’s Women’s Championship clash between Leicester and Manchester United at the King Power Stadium has been called off following the crash. 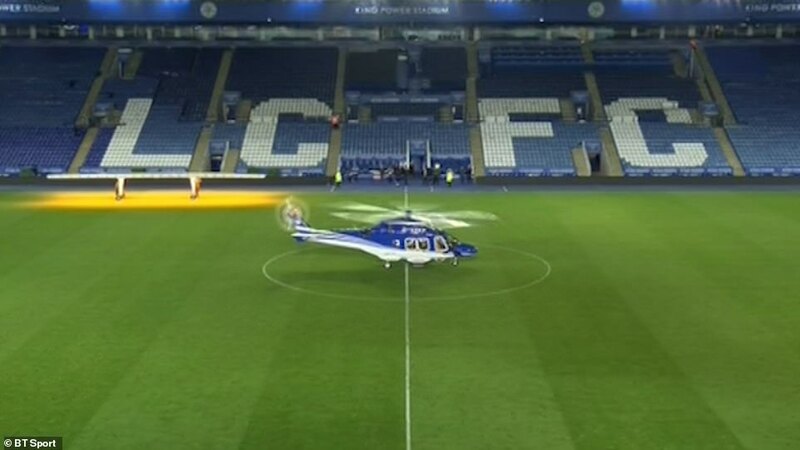 The Air Accident Investigation Branch will now be leading an investigation into the circumstances of a helicopter crash at the King Power Stadium.